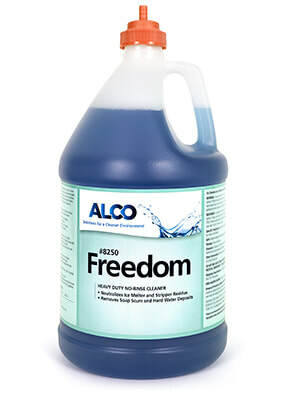 Alco Freedom Closed Loop - Alco-Chem, Inc. Excellent specially blended detergent for use on any washable surface. Attacks residue left from ice melters and hard water/mineral deposits. Can be used on aluminum, stainless steel, glass, gym floors, restrooms, leather, trucks and aircrafts, wood work, furniture and rubber floors.